Our public safety officials have worked hard to educate young drivers on this issue. However, education of our young drivers is much less effective if we don’t lead by example. It is difficult in a busy world to not be distracted while driving. Yet, we must work hard to practice safe habits that our children will see and absorb. 31 percent of parents reported experiencing a distracted driving incident compared to 17 percent of people without children. And fathers are most at fault. 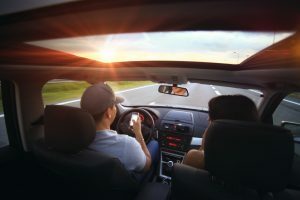 More than a quarter of them reported they were most likely to use their mobile phones while driving to make or receive a call or text without a hands-free connectivity system, 79 percent said they eat or drink while driving, and 57 percent said they would be distracted by another passenger. As parents, we face many potential distractions. We spend much of our time juggling our kids’ activities. School. Sports. Dance. The list is endless. The schedule is hectic. We are often pressed for time between events. Bad driving habits like speeding, tailgating, excessive lane changing, eating while driving, texting or using phone apps, are far too easy and convenient. We must remember that our children are watching our behavior (good and bad). All the safety talk in the world will have little impact if our kids see us continuously driving in a reckless or dangerous manner. Teenage drivers often mirror the driving habits of their parents. As parents, what should we do? We should consciously choose to set the example in our driving conduct as well as our speech. At the Blackwell Law Firm, we help people who have suffered a serious personal injury from a car accident. Outside of court, we believe in advocating for safer roads and highways. That’s why we have taken an active role in advocating for efforts to reduce deadly distracted and impaired driving in Alabama.